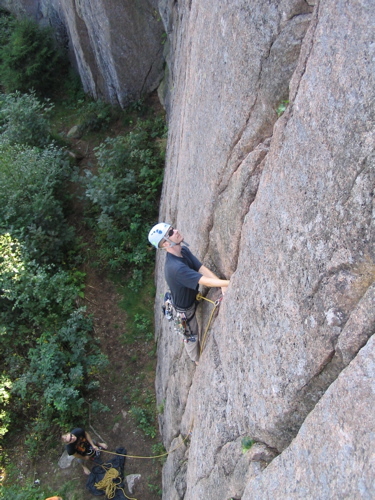 One and a half weeks ago I went to Kustavi with a couple of friends to do some trad climbing. Can’t really say that all went according to the plan. Early Saturday morning I had escorted my wife to the airport as she was flying to a business history workshop near Rome. I would be following her few days later to spend a long weekend in Rome to see some sights and to eat and drink properly. More about that later on. So, after the trip to the airport I waited for the others to pick me up. It is not too long a drive to Kustavi, only about 2,5 hours, so we didn’t have to leave at the first light of dawn, which was nice. They came and off we went. We had decided on the way to go for a crag called Kräkinniemi, which should have climbs of all grades and there should be plenty of top anchors too so we wouldn’t have to make any anchors from the trees or any of that stuff. The crag itself is a quite nice looking one. It has height from 10 to 15 meters and around 30 routes to choose from. It is but one of the many crags in the area, so you won’t run out of climbing even in a several days there. 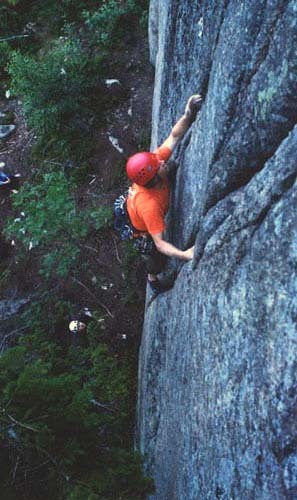 One notion though, most of the climbing is crack climbing and therefore you’ll get to do a lot of jamming. Personally I’m a novice in jamming and you really get more out of this place if you know how to jam properly. I took the first lead on an easy Masto (4). The others did it too after that and we all got up nice and clear. Next, I put my eyes on a double crack line, which was graded either 4+ or 5 depending on whether you used both of them or just either one of them. I decided to try using only the right hand side crack. I got up to the first tiny ledge just 2m up and placed a nut as high as I could. I clipped in and pushed myself higher. When I got my feet to the height of the first clip at around 4m, just above a tricky move, I started to place a second gear in. I shoved in a cam above my head and started to clip in and took some slack. Just as I was going to clip – I already had the biner in my hand – my foot slipped and I was slung off the rock. BAM. I slammed my left foot the the ground or to the tree root protruding off it. I did not come to the ground with full force as the first piece held and the rope did get taut and stretched. I think if I for some reason would have pulled my legs all the way up to my chest into fetal position I might have missed the ground altogether. So it was a quite close call that I hit the ground at all. Anyway, my first instinct was that “damn, now I’ll have to climb those tricky moves again”, which soon turned into “damn, my foot kind of hurts”, though. I took my shoes off along with the other gear and my belayer fetched an ice pack and a bandage for my foot. I realised that my climbing was over for now, even though the leg didn’t feel too bad. All I could do now was to keep the leg high and be as comfortable as I could. It was a beautiful day afterall. Clipping above your head is something that every one says you should not do, but still everybody does. It is like driving according to the speed limits. Everybody (well… most people do) says that you should not go faster than the limit, but still everybody speed every now and then. No matter what everybody does or preaches, here it really would have paid off to climb that one meter higher and clip from there. It is a mental thing though and this time my weak mind made my body weak too. Also, if I would have placed the second piece sooner, say 1 meter from the first piece it would have kept me off the ground, too. This also intertwines with the first as if I would have placed the gear lower, I could have also clipped lower. The spacing between the gear was ok, in my opinion and also according to the others, but I think I will from now on put the second piece in very clos to the first one. My friend did climb the same route later and said that he would not have put any more gear in unless I hadn’t taken a fall. He did then place an “extra” piece between my first and second placement and managed to do the climb. But, the story is not over yet. The leg had got a bit more painful and had swollen a bit. I said though that we could go on with the original plan and spend the night at the local campsite as we had travelled all the way here and it was getting kind of late. We packed things up and I hobbled to the car with my impromptu crutch made out of a stick. At the site we ate and prepared to sleep. I had taken with my my Rab Alpine Lite bivi and now it was a good time to test it. I could just lay it there on the grass and roll in and didn’t have to limp into a tent. Everything seemed to be ok – apart from the hurting and the fact that I couldn’t put weight on my left leg, but otherwise ok – untill in the middle of the night I woke up to an cruciating pain on my leg. I had taken the bandage off for the night and that was apparently a bad call. I put it back on and was able to sleep again soon after. Next morning the sky quickly changed from clear to very cloudy up to thunderstorm and rain. It was clear that we could not have been able to climb at all today even though we had already decided that we would leave for home in the morning. We drived home and I had already called my father-in-law to give me a lift to the emergency health center as it seemed a good course of action to show the leg to a doctor. We then spend a good four hours there, but I did hear that nothing was broken and that it was basically a twisted ankle. 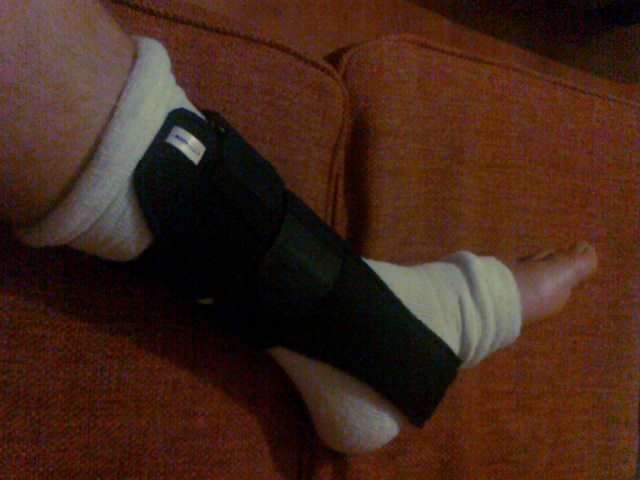 The treatment was rest, some pain killers and an ankle brace or air cast for three weeks and two weeks of sick leave. Also they gave me crutches to ease up the movement. The air cast is a removable brace which has a moldable cast inside it. This apparently is the way these kind of injuries are treated nowadays. I had a similar injury on my other ankle a few years ago and then they did put a sticky bandage on it, which you couldn’t take off. It was great to hear that nothing was broken, as that would have taken a long time to heal and could have jeopardized my Baruntse trip. I’m pretty confident that this won’t affect that trip at all, even though it does take up to three weeks to heal. Now, we finally come back to the trip to Rome which I mentioned earlier. We had planned to spend an extended weekend in Rome and my wife was already there so there was no way I was going to skip that. I would even roll over there if I would have to. After a few days spent lying on our couch, it was Thursday and time to fly. 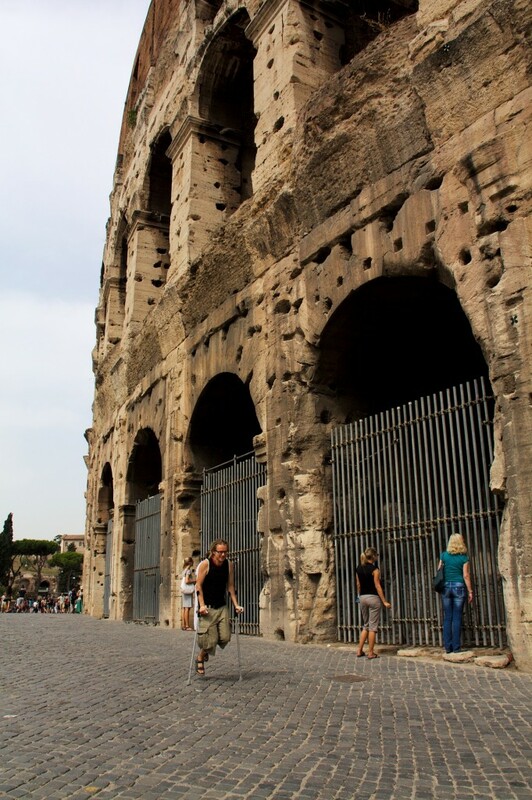 My leg wouldn’t still support me and I would go to Italy with crutches. It would certainly be a different kind of trip from what we are used to as normally we would walk a lot, and I mean a lot. Like fifteen or more kilometers a day, but now that would not be possible. I had already checked out some bus lines that would take us with minimum walk from one sight to another. We would also have to spend more time eating and drinking than zooming around the city. My wife was, as one could guess, quite stressed about all this and about how I would manage, but I was pretty confident that I could pull off quite many things even on crutches. Now looking back at the trip, it was pretty tough to go around on crutches. When I had got to the hotel the first evening my hands were already hurting like hell and my arms were sore. The first thing we did the next morning was to visit a pharmacy where I bought some sports tape to tape the handles on the crutches. They were beginning to dug in to my hands and my skin actually started to peel after the first day. The second day then started by taping also the hands. The palms were getting bruised and I had cramps and my fingers were a bit numb. Does not sound like a normal city break, does it? So, this was the way it went. A few steps and a rest, shaking those aching hands a little and off again. It was slow, but I did progress nonetheless. Eventually we managed to see almost everyhing we wished from Forum Romanum to Colosseum to Vatican and I would say it was a successful trip. We also did eat twice a day which is quite unusual for us on holiday, we just haven’t had time for that previously 😀 But now we had to use every available excuse to stay put for a while. In truth, we did not take breaks that often, which in part explains the sore hands. But I have to say that, what I lost in bruised hands I gained in excess training of my upper body. As anyone of you who has had crutches knows, it takes a lot from your shoulder/back/chest muscles to skip along with them. I never have had as such as great exercise on that area than while pushing myself up the stairs at Colosseum or the slopes of the famous hills of Rome. So, is there anything to learn from all of this? There is and then there ain’t. As I told earlier, the placement of the gear was in line according to my friends at the site. Yes, I could have climbed higher and not having to pull the slack to reach the clip, but that is how it goes. It could have been that higher up, there would not have been any place to hold you long enough to clip in and then I would have been even higher with no clips in between. As my other friend who I talked about this said, it was “a normal situation”, so I shouldn’t whip my self too much about it. As a co-incident, he had suffered an accident just few weeks earlier at Kustavi too, but not at the same place, though. He did suffer more critical injuries (concussion and memory loss), but the healing process was luckily much faster. You can read about that in his friends blog, if you can read Finnish that is. He has gathered up some very good pointers what do BEFORE the accident to get a better grip of the situation immediately. No, I'm not coming back from a day at the crag, but from a leisurous day at the ancient Rome. On crutches that is. Overall, I’m doing pretty well now, even though I still cannot truly put weight on my leg after 10 days from the accident, but it is getting better fast even though my hands are still hurting from the crutches. I’ve got my first “battle scars” now! Though it is not something you look forward to, now I know it might not be the end of the world. I’m also pretty happy too about the fact that I basically did not do anything “wrong” in a sense like forgot to close a screwgate, backclipped or something like that. I think this will just enhance my confidence in my own gear placement and my trusting them when taking a whipper. It is something you can’t learn from books, but you have to take those falls to gain it. In the next post I’ll have to get back to the Baruntse trip as it is lurking just behind the corner, maybe even too close 😉 In the mean time you can check some pictures from our Olhava trip early in the summer which I managed to finally edit and narrow down. This entry was posted in Climbing and tagged Accident, Climbing, Injury, Kräkinniemi, Kustavi. Bookmark the permalink.